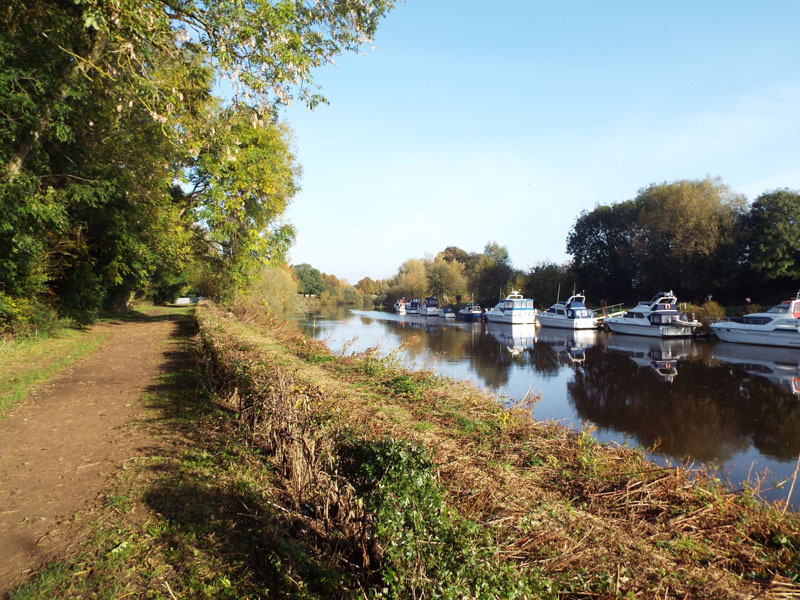 A recent planning application to extend an area of moorings for yachts on the Ouse has been the focus of much attention this week. It was covered in detail by York Mix and in a lengthy piece in the Press. (And originally covered in the Press earlier this month). There were a large number of objections to this planning application. Looking at the long list on the application’s page on the council’s planning pages reminded me of the objections to the proposals to put café tables in King’s Square a couple of years back. The similarity was striking: there’s one support comment (by a boating organisation) followed by endless reams of objections. Have a look. Proper evidence of public engagement, of people caring about a place. Caring about it not just for themselves but in a wider sense, a general public-spiritedness. Though King’s Square is a paved area in the city and this application involved a green area by the river the feeling in some ways seems the same: hands off, this is our land. Don’t privatise our public space. So hurrah, much rejoicing, etc. Except, if you look at those planning application documents, the ones in the list before all the objections, it’s a bit baffling. Well, I think it is. I am suffering from chronic sleep deprivation as a result of an elderly cat’s nocturnal persistent miaowings, so perhaps my tired brain is missing something obvious, but it doesn’t make sense to me. The Press report yesterday began with the sentence ‘CONTROVERSIAL plans by a motor yacht club to buy a section of York’s riverbank look set to be sunk by City of York Council.’ This gives the impression that the council are being firm and almost heroic, defending our riverbank against the yacht club, whose application seemed to come out of nowhere (even Fishergate councillor Andy D’Agorne mentions in his letter of objection that he wasn’t notified of it). Prior to the preparation of this planning application, beneficial pre-application consultation took place with the City of York Council, the advice of which has been incorporated in these proposals. In other words, in my reading of it, the council didn’t say ‘No, this won’t work, don’t bother’. Another letter (PDF) refers to the same pre-application consultation and includes a reference number. This document however doesn’t appear to be publicly accessible. I wonder what it said. So the applicants paid the £385 fee, and presumably a lot more for all the expert reports on trees and bats etc, also mentioned in this letter and included on the planning application page. Well why? You were before, in that ‘beneficial pre-application consultation’? A lot of effort and time and money wasted then. Presumably it was obvious that it wouldn’t be acceptable in that particular area, so sensitive, and so close to a community of people who would recognise not only the immediate threat to a beloved view but also the wider implications of public land being fenced off. Is it perhaps anything to do with the elections looming next year, and the massive unpopularity of the current administration? Perhaps we’re supposed to applaud the council for apparently listening to the public and ‘saving’ our riverbank? Who knows. The planning system and its mysterious workings … still, we must engage every now and then with its weirdness. 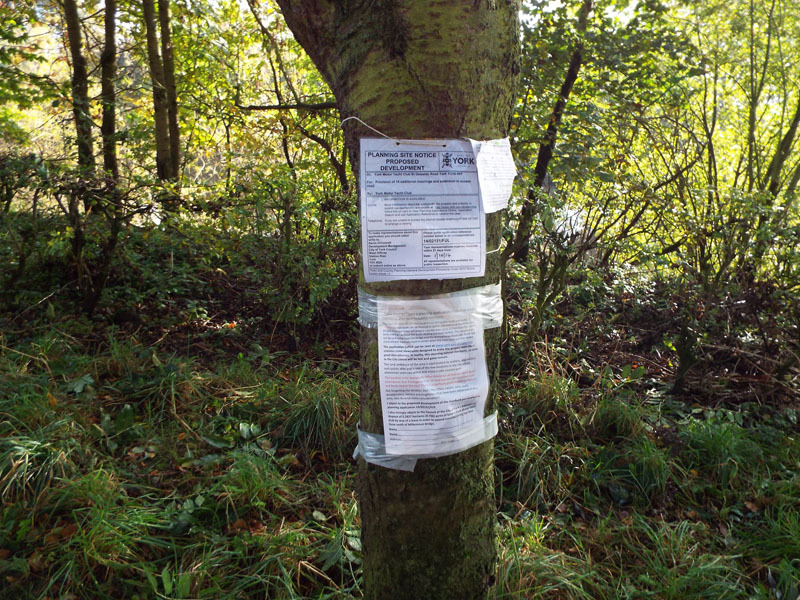 If you see one of these white A4-sized printed notices anywhere, pinned to a tree or a railing or a lamp post or a building, make sure you read it and share the information with your friends and with your local councillor. And perhaps stick your own notice underneath to explain more clearly what is actually involved, as happened here, on the riverbank. A protest against the plans took place at noon on the day I was writing this page. I couldn’t make it, but there’s a short video of the protest and the area involved, by Kim Hopkins (turn on HD in the bottom righthand corner for a better quality image). Thanks to Ralph Harrington for the photos included on this page. 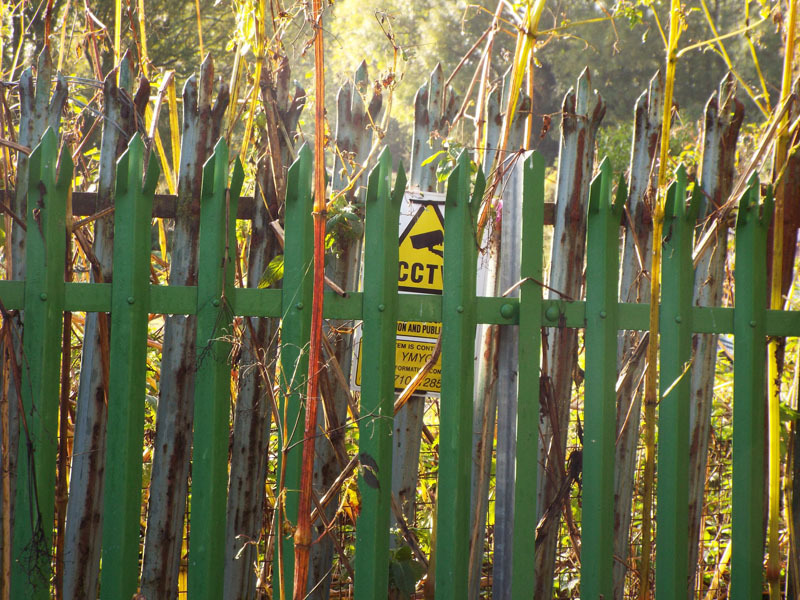 By Lisa @YorkStories • 19 October 2014 Green places, Opinions, thoughts To link to this page's proper location please use the > permalink. « Corner House pub to Tesco Express? As far as I understand, anyone can put planning permission in, and before the request was submitted the Yatch/Motor-Club were told by the council there was no chance of getting this through even before it was submitted. The real danger here is that if another party gets elected then there is a real fear that they may look into this and decide for it. Indeed anyone can make a planning application but it does cost money to do so, as do the associated expert reports on environmental impacts. Thankfully the application has been withdrawn. The bigger issue seems to be that we need to all be watching what applications are arriving at http://planningaccess.york.gov.uk/online-applications/ in future. 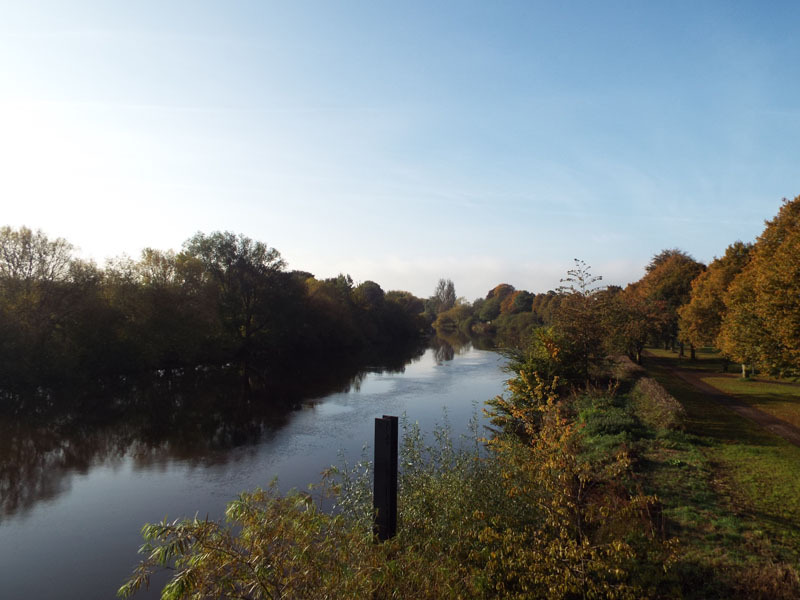 In a poem written before 800 A.D., Alcuin of York described the banks of the Ouse. The riverside area York residents love today is thus part of a millennial heritage. One of the objection comments on the planning application website even suggested that the environment and ecology there would be more or less unchanged since the Roman occupation. It’s extremely unusual for descriptions of cities in the early middle ages to include this kind of characterisation of nature as well as the built urban area and its monuments. Wonderful to have Alcuin’s words here, thank you.